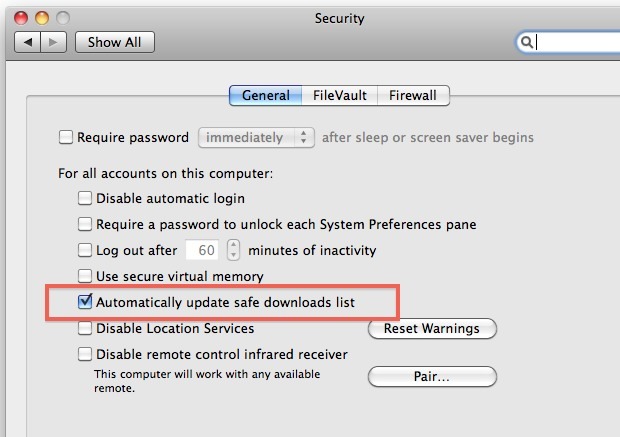 A recent anti-malware Mac OS X security update was released that defaults to automatically downloading and maintaining an active definitions list of known Mac OS X malware threats. This list comes from Apple and is likely a very small file that is transmitted to your Mac, imposing minimal bandwidth usage. For 99.99% of users, you should keep this option enabled and get the definition list automatically, it helps secure your Mac. Some of you are probably wondering why anyone would want to opt out of receiving the definition list. Maybe it’s to test the affects of malware on a crash box, maybe you have limited bandwidth or connectivity options and don’t want to use any unnecessary data, maybe you don’t like automatic communications with the outside world, maybe you don’t care about malware at all because it’s really not that big of a problem, who knows. Again, this is not recommended to opt out of unless you know what you’re doing, but it’s nice to know you have the option to if necessary. I don’t see much reason to download the lists considering there is already a variant that gets the protection. Just disable automatic downloads and there is no problem regardless. Simple to be safe. You’re right, that’s all anyone needs to do! And probably what most should do. maybe you don’t want the malware updates because you are already running an antivirus/antimalware ?? ?